We've added a new example template to the Template Gallery which demonstrates our new FlightStats gadget. FlightStats is a flight data service providing real-time information on flight schedules. 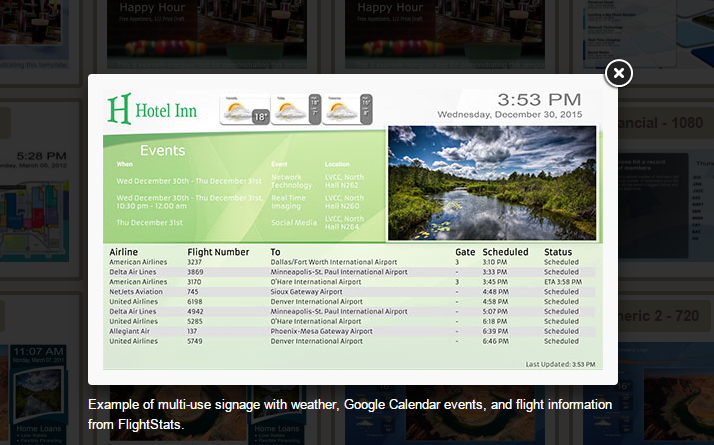 This new gadget provides an easy method of integrating flight arrival and departure times into your digital signage. The template demonstrates a multi-purpose sign with weather, events via Google Calendar, time/date, slideshow, and of course the FlightStats gadget. Perfect for a hotel lobby. To try this template, or any of the other sample templates, just go to the Template Gallery in your RevelDigital account, then click the button corresponding to the template you wish to use. This will copy the template and associated media to your account which you are free to modify or simply use as is. The FlightStats template is called Flight Board. works great - very easy to do!